Oil Color: I cannot tell from the brown apothecary bottle. Bottle Design and Artwork: This is a 5ml standard brown apothecary bottle. The label extends just under halfway around the bottom. The label features the name of the company and scent name/year in black text fields with white block font surrounding the image. The title of the collection is in black font situated along a vertical green text field. the image is a diagram of 6 different snowflake designs in yellow. Image created by ascentaday, 2013. ITB: Very much yuzu with grapefruit and some mint. Wet: Bright yuzu with heavy mint (almost juniper) with a delightful vanilla creaminess. It’s delicious, bright, and sweet. Dry: Very light mint complimented by yuzu. There is just a little warmness from the vanilla. Lovely. Bottle Design and Artwork: This is a 5ml standard brown apothecary bottle. The label extends just under halfway around the bottom. The label features the name of the company and scent name/year in black text fields with white block font surrounding the image. The title of the collection is in black font situated along a vertical green text field. the image is a diagram of 6 different snowflake designs in pink. Image from wishingwell on BPAL.org. ITB: IT’s pale pink roses, a little green, and vanilla that adds an interesting creaminess to this scent. Wet: It’s very similar to what it smells like in the bottle, although the creaminess/vanilla is stronger on my skin. Dry: Ah, the rose comes back out. It reminds me of a younger version of Rose Red with it’s vanilla note and the impression of pink rather than red roses. Bottle Design and Artwork: This is a 5ml standard brown apothecary bottle. The label extends just under halfway around the bottom. The label features the name of the company bolded blue block font, which mirrors the scent name in the same font but larger at the top of the image. The image itself is over individuals dressed in long black coats having a snowball fight. ITB: It reminds me of blueberry snow cones. Yum! Wet: Slushy blueberries with a hint of blackberry jam. Gosh, this is heavenly. Dry: The blackberry is a bit more distinct here, although the blueberry is still sweet. I’m also getting a lime and the snow note. It’s a really delicious and fun scent. I only have an empty bottle of this one for some reason. I’ll see what I can get out of it, but it looks pretty dry. Bottle Design and Artwork: This is a 5ml standard brown apothecary bottle. The label extends just under halfway around the bottom. The label features the name of the company in very small white block font against a black text field right below a shadowed text box that contains the collection in minuscule font and the title of the scent in black-outlined font. The image is of two lovers, one of whom is wearing an oni mask, enjoying each other’s company in a rice field while two others watch in shock. ITB: It’s much more plum-centric than I had anticipated. There is a touch of vanilla sandalwood, but I can’t discern the other notes. It’s fruity, flowery, and feminine. Wet: There is really almost nothing, but what fraction of a drop I managed to eek out of the bottle smelled exactly the same on my skin, thank goodness. I’d love a little more of this. Dry: It’s perfume-y plum blossom and a touch of sandalwood, but it is faint since I was able to get out so little in the first place. Oil Color: – I cannot tell the color of the oil by looking into the brown apothecary bottle. Bottle Design and Artwork: This is a 5ml standard brown apothecary bottle. The label extends just under halfway around the bottom. The label features the name of the company and event along the bottom in thin white block font. The same The scent name takes up most of the remaining label in cursive white font. Honestly, the brown label and lighter brown image are hard to describe. It looks like a tilted ancient wine amphora adorned with ribbons. ITB: This one is really sweet for me. I want to like it, but it ends up smelling like cherry & Rico-la herbed cough drops the longer I sniff it. Wet: Okay, I’m giving it a chance to wow me on my skin. Fingers crossed! Alright, the red apple is much nicer on my skin. It’s like a candied apple in the distance, framed by pomegranate juice what has been infused with a few drops of honey. It’s much better on the skin. Dry: It smells like pomegranate, red berry, and apple potpourri. There is a bit of sweetness to it, like a spiced cider, but it is so much nicer even than when applied wet. I’m pleased I have given this a second try! Bottle Design and Artwork: This is a 5ml standard brown apothecary bottle. The label extends just under halfway around the bottom. The label features the name of the company along the bottom in small white block font outlined in green along with the collection in even smaller font above it. 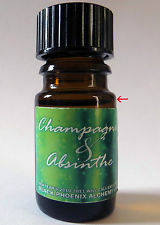 The same for the scent, which is in a cursive, Italic white font across an image of a green absinthe-champagne with bubbles. ITB: The champagne actually smells like a good quality ginger ale on first sniff. Behind it, lemon and a dash of licorice quickly come to the forefront. The longer and deeper I smell it, the more I’m able to tell that it is champagne, but I don’t get it on a cursory whiff. Wet: The absinthe comes out strong on my skin while wet, although I’m still getting a lemony note. Dry: While it begins to dry, I can distinguish the champagne, but the lovely scent of licorice seems to be fading a little. I still get lemon for some reason, but not as strong. It’s a very subtle combination of notes overall. Once completely dried, the champagne is very evident, which is melding beautifully with some of the absinthe notes, although I still get some lemon in there too. Other Impressions: Overall, this is a beautifully subtle scent that I might wear any time I want to feel effervescent or to brighten the cold days of winter. Bottle Design and Artwork: This is a 5ml standard brown apothecary bottle. The label extends just under halfway around the bottom. The label features the name of the company along the bottom in small reddened block font outlined in white along with the collection in even smaller font above it. 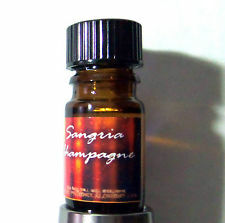 The same of the scent is in a cursive, Italic white font across an image of a dark champagne with bubbles. ITB: I get fizzy champagne, red wine that has started to turn (a little vinegar), fruit, and something that reads as soft and cloying, like vanilla. Wet: Whew, that cloying note isn’t present on my skin. Now, it is aged wine, champagne, muddled orange soaked in the aged wine, cola, and one or two other fruits I can’t place. This is sangria to a “T”. Dry: It’s interesting in this state because it becomes softly fruity and resinous with faint effervescence. I like this one so much more once dried. Bottle Design and Artwork: This is a 5ml standard brown apothecary bottle. The label extends just under halfway around the bottom. 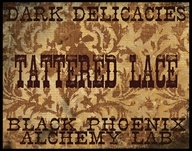 The label is a spin-off of Snake Oil’s in that it has the same parchment colored background, black ombre scroll work framing bold, shadowed block font with collection information underneath. 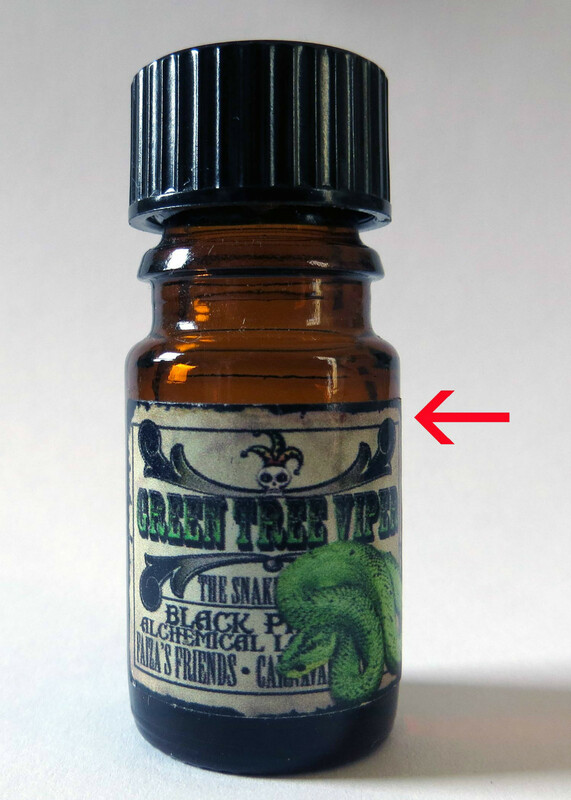 The black font under the bottom ombre scroll/floret reads “The Snake Pit / Black Phoenix Alchemical Lab / Fiaza’s Friends / Carnaval Diabolique.” The image is of a green tree viper superimposed over the company and collection information. ITB: I can certainly smell a few varieties of mint. One is pure and green like mint liquor, while the second I detect is a duskier mint, like those in natural cough drops. The Indonesian oil and vanilla rise up to meet the mint the longer I sniff. Wet: Indonesian oil, vanilla, tea, dusty mint, and bergamot with a hint of green tea. It’s an intriguing scent. Dry: It’s warm, slightly resinous, and minty now from the vanilla, bergamot, mint, and oils. There is a light foody quality to this, but the addition of the mint makes it very palatable and interesting. Bottle Design and Artwork: This is a 5ml standard brown apothecary bottle. The label extends just under halfway around the bottom. 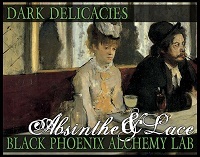 The label features the name of the company along the bottom in absinthe green block font against a black text field; above the image is the company for which it was made. The scent name white Italic romantic font just above the company name. The image is Degas’ L’Absinthe. ITB: It’s absinthe, but much softer from the lace and the tobacco smoke. Wet: The scent is almost fruity when I apply it to my skin. I think this is from the green cognac, which is followed by the absinthe and then the tobacco smoke. I don’t get the same softness from the lace as I did in the bottle. Dry: The tobacco now emerges as the primary note, which melds beautifully with the green cognac, light absinthe, and sugared lace. Bottle Design and Artwork: This is a 5ml standard brown apothecary bottle. The label extends just under halfway around the bottom. The label features the name of the company along the bottom in white block font against a black text field; above the image is the company for which it was made. The scent name white Italic romantic font just above the company name. The image is of a woman in mourning lace set against a foggy background. 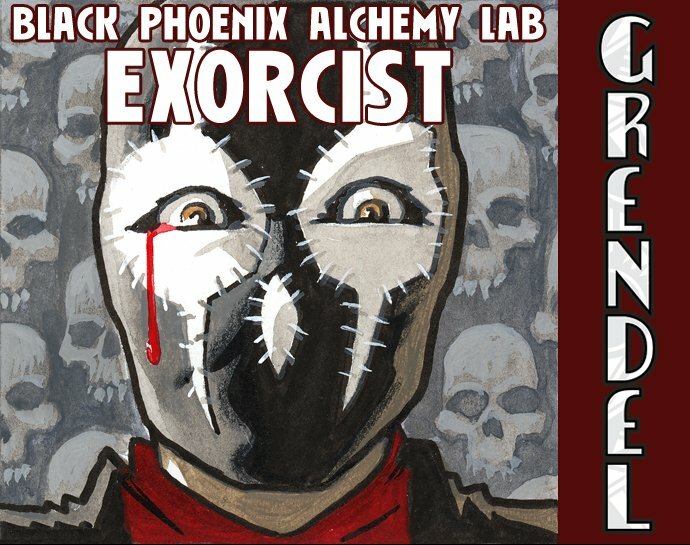 Image from Dark Delicacies and scent base. ITB: It’s rather spicy, actually. It smells almost like sweet cinnamon, but I know it’s clove mixed with cognac, vanilla blossom, and myrrh. Wet: Dusty clove is still the top note, followed by frankincense. I really can’t smell much else right now. Dry: It’s beautifully and sweetly resinous once dried – myrrh and frankincense followed by oak and vanilla blossom…and faint clove. Bottle Design and Artwork: This is a 5ml standard brown apothecary bottle. The label extends just under halfway around the bottom. The label features the name of the company along the bottom in black block font; above the image is the company for which it was made. The scent name is thick, western black font just above the company name. The image is of tattered lace. ITB: It’s cognac, opium, and frankincense fresh from the bottle. Wet: That’s lovely. Bourbon vanilla, opium, cognac, tea, frankincense, and something that does remind me of silk. Dry: It’s warm (bourbon vanilla), feminine (silk and coconut bark), and deliciously resinous from the frankincense and opium. Bottle Design and Artwork: This is a 5ml standard brown apothecary bottle. The label extends just under halfway around the bottom. The label features the name of the company along the bottom in taupe block font; above the image is the company for which it was made. The scent name is black thin font just above the company name. 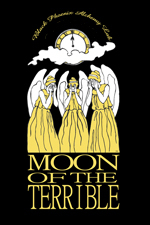 The image is the a woman in turn-of-the-century garb mounted on a broom heading toward a jock-o-lantern, set against a full moon. 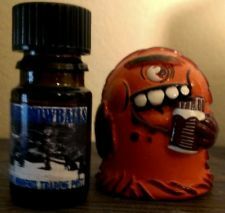 ITB: I had to put this off for a few days while I waited for my cold to dissipate as this is not the strongest scent. It’s leaves, linen, cognac, tobacco, and sugared lace in the bottle. Wet: The cognac is much stronger on my skin and the laudanum is now present. I get a little black tea with the linen, sugar spun lace, and thick tobacco. Dry: It is certainly party of the lace family. The linen and tobacco reign supreme, but are followed closely by the sugar spun lace and Indian musk. It’s a lovely scent. Bottle Design and Artwork: This is a 5ml standard brown apothecary bottle. The label extends just under halfway around the bottom. The label features the name of the company name and collection along the bottom of the label in black block font with the name of the scent iin bold black font straight across the top. 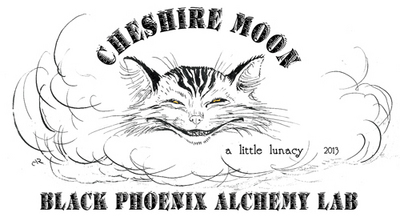 The image is of a smiling Cheshire Cat. ITB: It’s light, buoyant, and fruity – guava, cherry blossoms, and lemon balm. Wet: Yum. Lemon balm, lemongrass, guava, hibiscus, and grapefruit. I love how tropical this smells. Dry: Once dry, it’s somewhat faint. The scent is primarily lemon balm, lemongrass, and pink grapefruit. I really enjoy the fruitiness of this one. Bottle Design and Artwork: This is a 5ml standard brown apothecary bottle. The label extends just under halfway around the bottom. The label features the name of the company along the top of the label in white bloc kfont with the collection name and date is super tiny white font underneath. 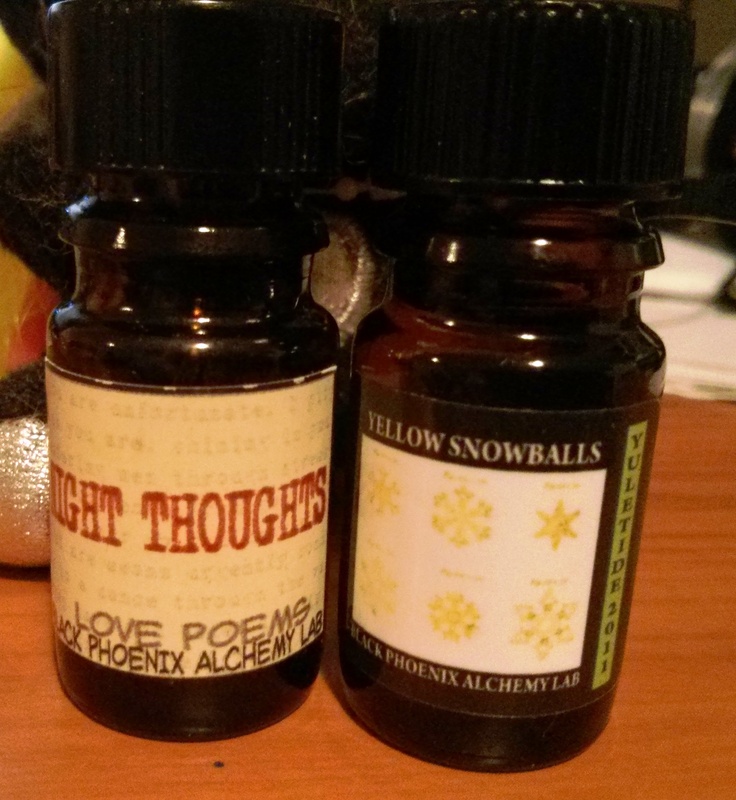 The scent name is in large yellow block font just below the image of winged angels sobbing. ITB: Yum. Resin and lychee. Of course, lychee is my favorite note in the world, so this is made of win so far. Wet: Lychee is still strongest, witch which I’m absolutely fine, then followed by starfruit, snow, and some carrot seed. Dry: It’s gorgeous, simply gorgeous. This will be my lychee-lavender-snow go-to from now on. It’s fruity and cool. Scent Description and Notes: “Love and Pain, Edvard Munch. Copaifera is an earthy, sweet-smelling resin from Copaiba trees. Bottle Design and Artwork: This is a 5ml standard brown apothecary bottle. The label extends just under halfway around the bottom. The label features the name of the company along the bottom in auburn block font while the name of the scent is just about in larger white block font. The image is a a painting of two individuals embracing, but it looks like one of whom needs comforting. Love and Pain, Edvard Munch. ITB: It’s a bit hard to smell, but I can pick up the copaifera and a little lavender, but it is super faint in the bottle. Wet: Gosh, it is still hardly detectable even on my skin. I have to concentrate, but when I do, it’s all lavender. I think my cold or whatever it is is catching up with my nose. Dry: Ok, now I’m getting something gloriously sweet, like warm honey mixed with amber and vanilla, plus the edition of lavender. It’s sweetly soothing. Scent Description and Notes: “Michael Casts Out All of the Fallen Angels, Gustave Doré. Bottle Design and Artwork: This is a 5ml standard brown apothecary bottle. The label extends just under halfway around the bottom. The label features the name of the company and collection along the bottom in black block font set against a white text field. The scent name is situated above the image, also in black font and inside a white text box. The image is a a partial depiction of Dore’s work in black and white of Michael casting out the fallen angels. ITB: It’s resinous but also green for the valerian root, styrax, and the galbanum. Wet: It’s very similar to its composition in the bottle, although there is a little more muskiness. Dry: The scent stays very close to the skin. I get galbanum, sandalwood, musk, and dammar. It’s nice, but I wish it were stronger. Garden of Death, Hugo Simberg. Bottle Design and Artwork: This is a 5ml standard brown apothecary bottle. The label extends just under halfway around the bottom. The label features the name of the company and collection along the bottom in black block font set against a white text field. The scent name is situated above the image, also in black font and inside a white text box. The image is a a partial depiction of Simberg’s work of skeletal figures clad in black tending to a sparse garden of death-associated herbs and flowers. ITB: Whoo! That’s very green. It’s like freshly cut grass and the bitter scent of broken poppy stems. Wet: It’s really bitter in its greenness. I can discern the parsley, acanthus, belladonna, spicy chrysanthemum and the sweetly floral iris. The jury is still out on this one. Dry: It’s a bit more floral from the iris and mellow from the manioc, although the belladonna and acanthus are still just as present. There is a little loam tone to this, but not much. This is much prettier once dried, although if you love really green scents, give this a try. The Mandrake Charm, Henry Fuseli. Bottle Design and Artwork: This is a 5ml standard brown apothecary bottle. The label extends just under halfway around the bottom. The label features the name of the company and collection along the bottom in black block font set against a white text field. The scent name is situated above the image, also in black font and inside a white text box. The image is a a partial depiction of Fuseli’s painting of a person doubled over in a smoldering circle while a child crawls over him or her and celestial beings seem to watch on. ITB: This is green and pleasantly earthy from the mandrake and basil linalool. There is also a disquieting floral after the initial scent that is discernible, which must be the hyssop. Wet: Earthy and spicy in it’s herbiness. The scent seems to amp the mandrake the most on my skin. Other notes are harder to pick out, but I think I get a little basil linalool, lemongrass, and a faint impression of olibanum, but it’s mostly a mandrake show. Dry: The mandrake is still dominant, but it settles down some with olibanum and a little lemongrass. 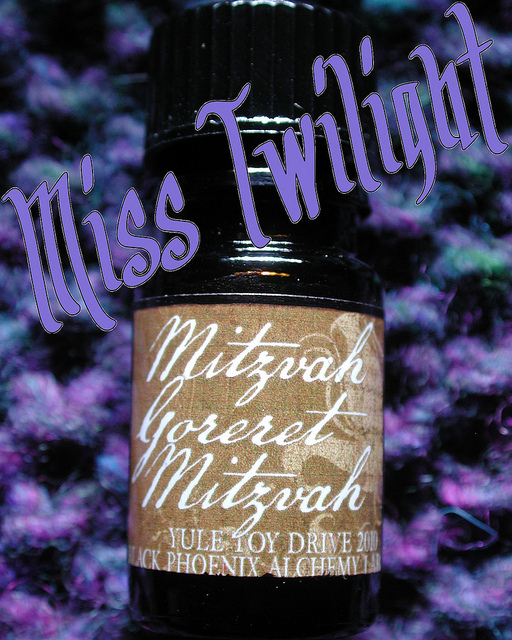 I wish the myrrh was more prominent, as it would add a wonderfully resinous tone to this green and eathy scent. Christine’s lover who, in the aftermath of her violent death, becomes haunted and possessed by what he sees as the “entity” of Grendel. ITB: Ooh, a very lovely and almost light lilac fougere with a touch of styrax. Wet: It’s very similar on my skin when compared to the oil in the bottle. The only different is that the frankincense is discernible. Dry: The frankincense and musk are strong once it has dried, but the lilac and styrax soften it and lend a bit of powderiness to the scent. I enjoy this one! I love leather and ambrette notes. This should be a scent made in olfactory heaven. Bottle Design and Artwork: This is a 5ml standard brown apothecary bottle. The label extends just under halfway around the bottom. The label features the name of the company and collection in navy block font bracketing a navy text field with cut-outs of the scent name. The image is a shunga print of couples fornicating. ITB: Bourbon vanilla, ambrette, and champaca flower. The combination smells like a floral banana smoothie to me. Wet: Champaca flower…oop, there’s that banana again. Okay, now that I concentrate, there’s bourbon vanilla, ambrette seed, and the tiniest dab of leather. It’s somewhat spicy if I had to categorize this scent. Dry: Okay, less banana now and more champaca flower, ambrette seed, bourbon, and light frankincense. It’s nice, but not awesome.